The position would normally last for four years—the duration of the Governor’s appointment. The association in a recent Press Release, recalled that in 2013, the United Kingdom (UK), gave the overseas branches the choice of choosing a local President, or continue with tradition. In 2014, the Ms Kather Smith, a former Commissioner, was nominated and approved by UK to become the President. According to the release, when Ms Jaspert arrived in 2017, Ms. Smith was and is still serving her term as President. It was explained that upon meeting with Ms Jaspert, the Executive Council, thought it would be beneficial to have her involved in the association. 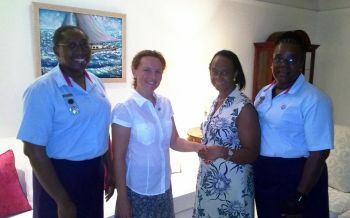 As ssuch, former commissioner, Ms Yvette Martin-Stoutt, presented a motion to have Ms Jaspert serve as Ambassador. 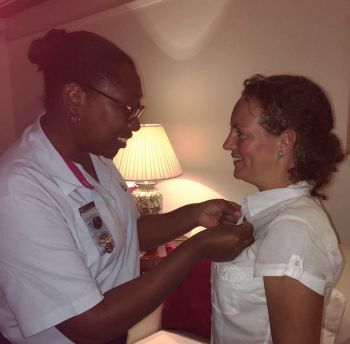 On Monday, October 29, 2018, last Ms Jaspert was pinned by Commissioner, Teashan Thomas, to officially become Ambassador for the BVI Guides Association. In her role as Ambassador, Mrs Jaspert, will act as a representative of Girl Guiding in the VI; share what the association does in the community, and promote the mission of empowering girls.